No idea what you're doing? No problem. 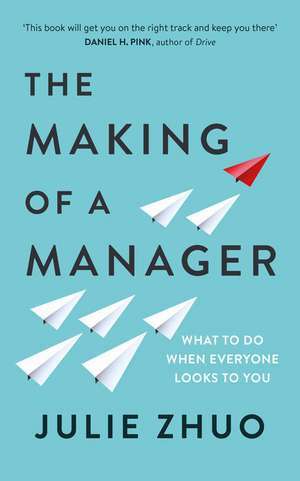 Good managers are made, not born. Top tech executive Julie Zhuo remembers the moment when she was asked to lead a team. She felt like she'd won the golden ticket, until reality came crashing in. She was just 25 and had barely any experience being managed, let alone managing others. Her co-workers became her employees overnight, and she faced a series of anxiety-inducing firsts, including agonising over whether to hire an interviewee; seeking the respect of reports who were cleverer than her; and having to fire someone she liked. Like most first-time managers, she wasn't given any formal training, and had no resources to turn to for help. It took her years to find her way, but now she's offering you the short-cut to success. This is the book she wishes she had on day one. Here, she offers practical, accessible advice like:* Don't hide thorny problems from your own manager; you're better off seeking help quickly and honestly* Before you fire someone for failure to collaborate, figure out if the problem is temperamental or just a lack of training or coaching* Don't offer critical feedback in a `compliment sandwich' - there's a better way!Whether you're new to the job, a veteran leader, or looking to be promoted, this is the handbook you need to be the kind of manager you've always wanted.